By Linda Qiu on Wednesday, July 22nd, 2015 at 3:09 p.m.
Before his announcement, a number of readers asked us to look into various versions of the claim. Did Obama really lower the White House flag for Whitney Houston? And was it unusual for him not to lower to half-staff in honor of the fallen servicemen? The meme, Schilling and others struck out on the claim about flags lowered in honor of the singer. But the comparison is hardly new. As our friends at Snopes have pointed out, Obama never lowered Old Glory for Houston when she died of an overdose in 2012. It was New Jersey Gov. Chris Christie, a Republican, who ordered flags at half-staff for the musician, who was born in Newark, N.J. Christie initially drew criticism for the decision. It should be noted that Obama did not order the flag to be lowered for the Charleston shooting in June 2015 or the second Fort Hood shooting of 2014. Overall, the data shows and experts agreed that it took more time than usual for Obama to issue a proclamation for the Chattanooga shooting. "This time, it’s been a little slow in happening," said Mike Buss, a flag code expert at the American Legion, adding that the group is glad that the president has issued a proclamation. Per the U.S. flag code, which dates back to the 1920s, it is up to the president to decide when flags at federal offices should be flown at half-staff, though the rules stipulate 30 days for the deaths of presidents and shorter durations for other government officials. The law also says governors and other heads of government can decide for their own jurisdictions -- typically, if a soldier dies in the line of duty, his or her governor gives the half-staff order. A president lowering the flag for fallen soldiers is not typical, otherwise it would always be at half staff, experts said. "Normally, you wouldn't have a presidential proclamation for individual soldiers," said John Hartvigsen, president of the North American Vexillological Association. "They’re really for when whole nation is mourning. But (the Chattanooga shooting) doesn’t really fit into what’s normal." In addition to Chattanooga, Obama also lowered the flags in response to other mass shootings of servicemen at the Washington Navy Yard in 2013 and Fort Hood, Texas, in 2009. Experts told us there is no defined guideline for when flags at half-staff is appropriate, though they emphasized that compared to the immediacy of the response, duration often carries more meaning. Even then, the symbolic gesture can only go so far. Flags are continuously lowered for Pearl Harbor Day, for example, but Hartvigsen argued that the practice meant more Dec. 7, 1945, than it will Dec. 7, 2015. He also pointed out that flags were lowered 30 days to mourn both Kennedy and President Gerald Ford, even though Ford’s death 30 years after his presidency didn’t inspire "the same amount of mourning" as JFK’s assassination. Still, a half-staff directive can be instinctive and reflective of a nation’s grief. The gesture, which originates from the maritime tradition of lowering a ship’s flags to half-mast as a sign of respect and mourning, became widespread during World War II, according to the vexillological association’s protocol officer, Jim Ferrigan. "The country just doesn’t wait for the president sometimes," he said. "On Sept. 11, those flags were down that day." Buss, of the American Legion, said the American flag was lowered every day during World War II and the Vietnam War. 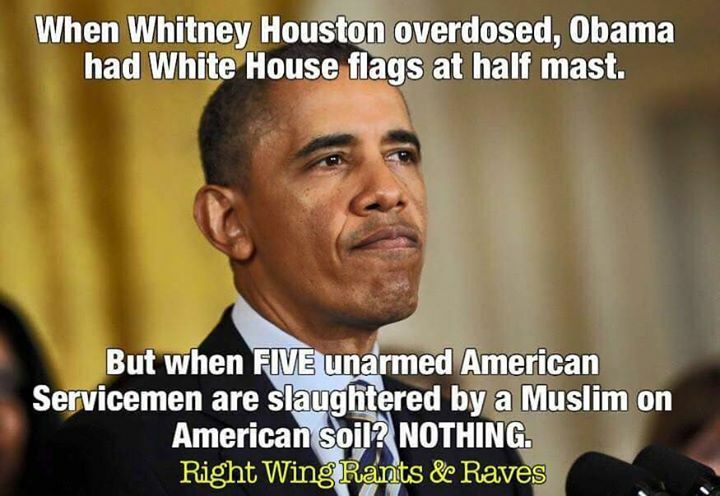 Various claims about Obama lowering the White House flag to mourn Whitney Houston but not for the five soldiers slain in Chattanooga are not entirely accurate. It is wrong to suggest Obama issued a half-staff proclamation for the late singer. Memes (and Curt Schilling, maybe) confused him with Gov. Chris Christie, who ordered the New Jersey flags to be lowered for Houston, a native of the Garden State. Ultimately, Obama decided to order flags at half-staff, though he waited five days after the July 16 attack. The flag will remain at half-staff for five days, a day longer than similar shootings at the Washington Navy Yard and Fort Hood. Experts agreed that while the delay was longer than usual, duration is often a more potent symbolic gesture of mourning.